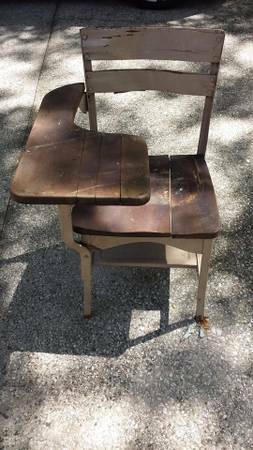 Vintage Metal & Wood School Desk - Needs wood glue on seat and writing area, but wood is very old and sturdy. Back slats need work. I couldn't find one like this on Ebay, but some not quite as old are selling recently for $100. Asking $50 OBO. Please contact me via email through this site. Scam and spam emails will be reported. Must pick up in Spanish Fort.